Whether your project involves mining, excavation, trenching or sinking shaft, you need the appropriate tools for the job. At Alpine, we know that almost is just not good enough in the precision field of construction. As a result, Alpine is proud to supply the most powerful and precise cutter heads and cutter picks for every need. Alpine cutter heads come equipped with the standard picks that will help you power through most rock and concrete projects. However, many projects require specialized tools to tackle difficult rock or achieve a precise finish. For this reason, Alpine stocks a large variety of picks that are customized for specific types of rock or for specialized projects. 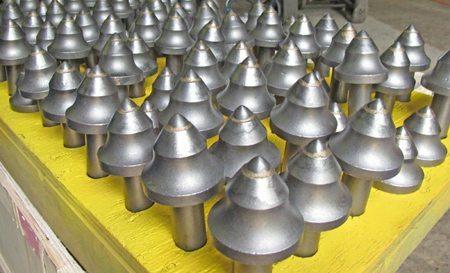 Our cutter heads are excellent tools for a variety of types of work. For example, we have cutting equipment made specifically for concrete cutting, including demolition work or scaling concrete walls, including abutments or dams. In addition, we have equipment designed for precise and powerful excavation of soil, concrete, asphalt, and rock. Alpine rotary cutter heads are designed specifically for mining and building tunnels, such as transportation tunnels, wine caves, or mining tunnels. The cutter heads are also highly accurate and precise for cutting trenches, pipelines and footings. Our cutting equipment is so precise that you can work around existing utility lines easily and safely. In addition to these applications, our cutting equipment is commonly used for vibration-free scaling of delicate concrete structures such as bridges or abutments. The angle of pick-to-concrete contact is designed to virtually eliminate over-breaking. Our cutter heads can help you carry out quarrying projects with any size carrier machine, including skid steer loader, backhoes and excavators. Even underwater projects are no match for our Alpine Cutter heads, with a simple waterproofing adjustment, the cutting equipment will help complete projects underwater in freshwater or saltwater, and even in deep depths. Alpine cutting equipment are also great stump grinders! No project is too large, too small, too complicated, or too abrasive for Alpine cutting equipment. If you are not sure which cutting equipment is right for the job, contact us either online or by telephone with the details of your project. One of our skilled representatives will get back to you with a description of the equipment you need as well as a price estimate. We also offer other specialized equipment, such as soil mixing equipment. Contact us for more details.